©Bryan Pickering; Eye Ubiquitous/Corbis. Reproduced by permission. 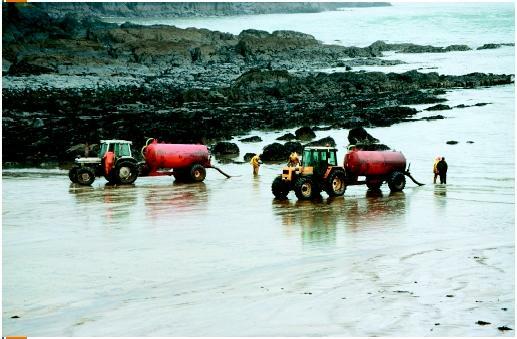 remediation to date has been in response to such historical chemical management practices as dumping, poor storage, and uncontrolled release or spillage. Greater effort in recent years has been directed toward pollution prevention, which is more cost-effective than remediation. 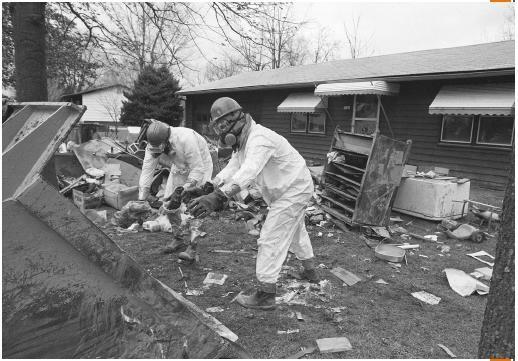 Programs such as Superfund in the United States, as well as parallel state programs, represent a commitment of billions of dollars to the cleanup of contaminated sites. impacts. Such protection begins with the planning and implementation of characterization and clean up efforts. Minimizing contact with contaminated media is the optimal method for managing risk to site workers. When such contact is necessary, or when the nature of the contamination is unknown, as in initial characterization activities, personnel protective equipment (PPE) is used to protect site workers. The major routes of exposure for workers at contaminated sites are through dermal (skin) or inhalation pathways. PPE is categorized by the level of protection it provides to these two exposure pathways, ranging from simple dermal protection such as overalls and gloves to fully encapsulating suits with supplied air. The level of protection needed is based on the nature and extent of knowledge of site conditions—less information requires more protection. Groundwater. DNAPLs such as chlorinated solvents may be treated with chemicals (e.g., potassium permanganate) that degrade the solvents into relatively harmless chemicals. When combined with chlorinated solvents, potassium permanganate removes chloride ions , which results in the degradation of these chemicals to carbon dioxide (CO 2 ) and water. This technology holds promise as a tool for remediating these challenging contaminants. SEE ALSO A BATEMENT ; B IOREMEDIATION ; D REDGING ; E CONOMICS ; I NCINERATION ; L AWS AND R EGULATIONS , I NTERNATIONAL ; L AWS AND R EGULATION , U NITED S TATES ; ; N ONAQUEOUS P HASE L IQUID (NAPL) S UPERFUND ; T IMES B EACH ; U NDERGROUND S TORAGE T ANK ; W ATER P OLLUTION . U.S. Environmental Protection Agency Superfund Program Web site. Available from http://www.epa.gov/superfund .